A group of Calocybe gambosa (St. George's mushroom) have also appeared on the cricket ground in Five Roads since the rains started. 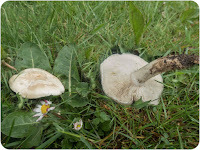 Good to see some 'vernal' fungi are 'showing'. I have not found this species very often but where found it will probably be seen at same spot for ? ?many years.